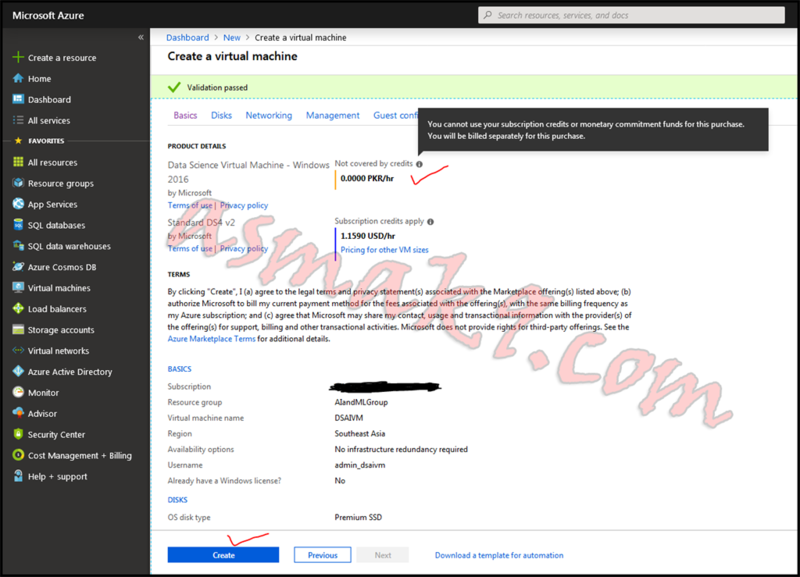 This article is about setting up Microsoft Azure Data Science Windows 2016 Virtual Machine into our Microsoft Azure paid subscription account. One of the key issues with data science domains is finding a complete resource and cost-effective solution to meet your data science needs. Since the processing of a data science problem requires a powerful machine, it is not very cheap to afford an individual machine to carry out the desired task. On top of it, the cost of licensing for data science products is not very cheap either. If your problem demands more power, then the added cost of installation and setup of required tools and technology on the required machine can be a headache. You also need to think about the scalability of your problem. Microsoft Azure is no doubt a complete solution as it offers many powerful solutions to meet data science domain needs. Microsoft Azure Data Science Windows 2016 virtual machine is one such example. One might wonder why Azure Data Science Windows 2016 virtual machine is different than any other regular Azure VM. Well, the key difference between Azure Data Science Windows 2016 VM and a regular Azure virtual machine is that Azure Data Science Windows 2016 VM is pre-installed with a lot of data-science related tools along with the GPU setup of NVidia for deep learning solution development purposes. 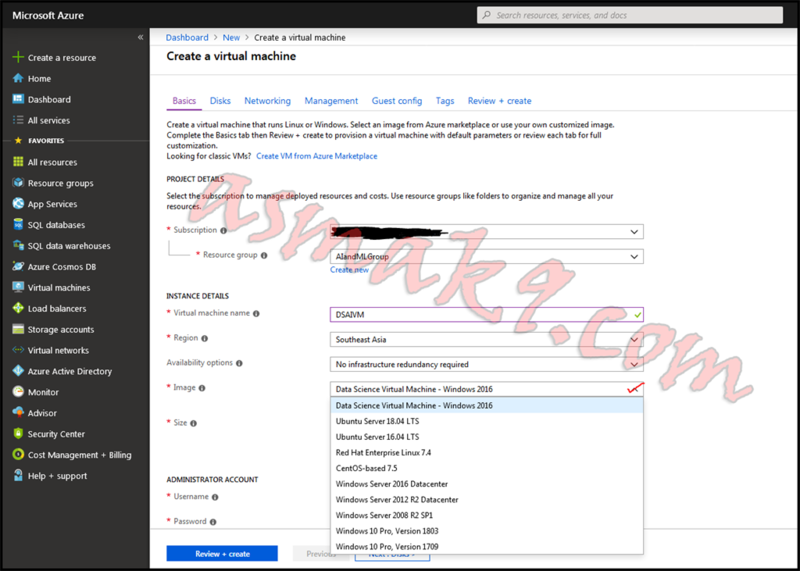 In today's article, I shall demonstrate the set up of a Microsoft Azure Data Science Windows 2016 virtual machine into our Microsoft Azure paid subscription account. You have already created your target Resource Groups on Azure Portal. 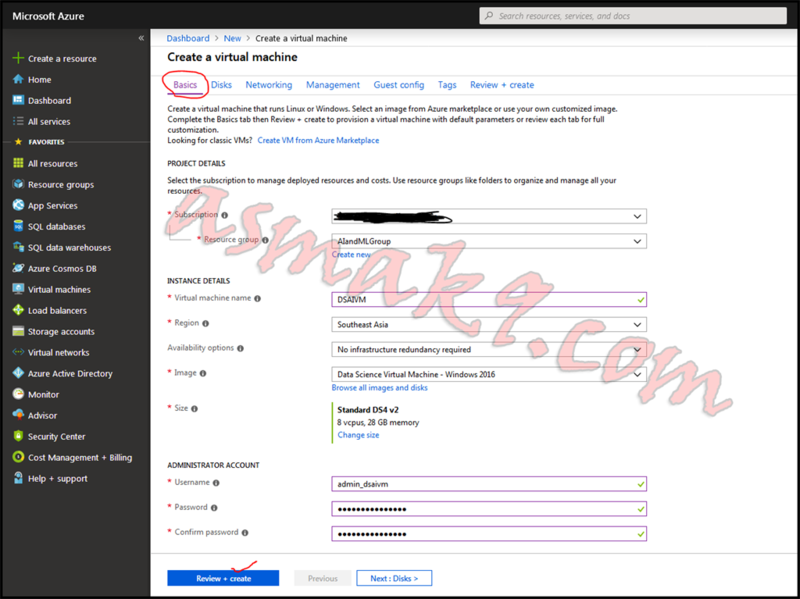 Create a Microsoft Azure paid subscription account. 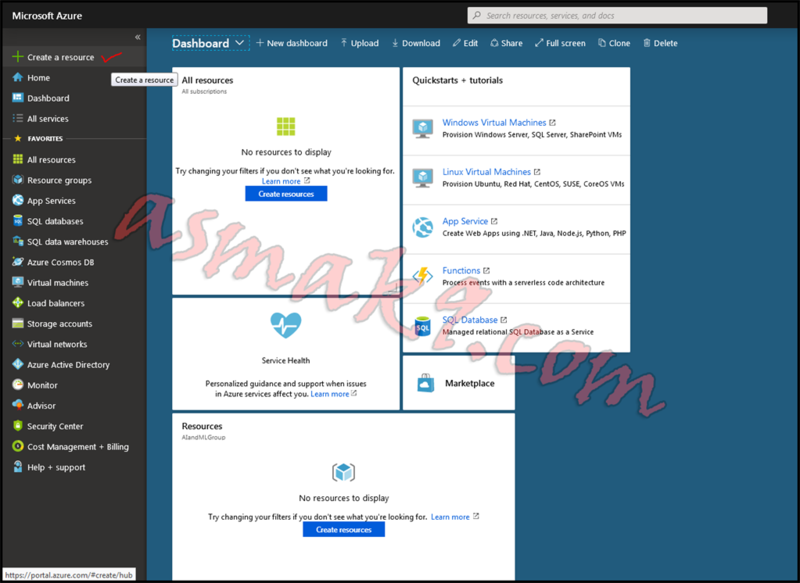 Login to Microsoft Azure portal and you will be able to see your dashboard. Click "Create Resource" from the right menu, as shown below. 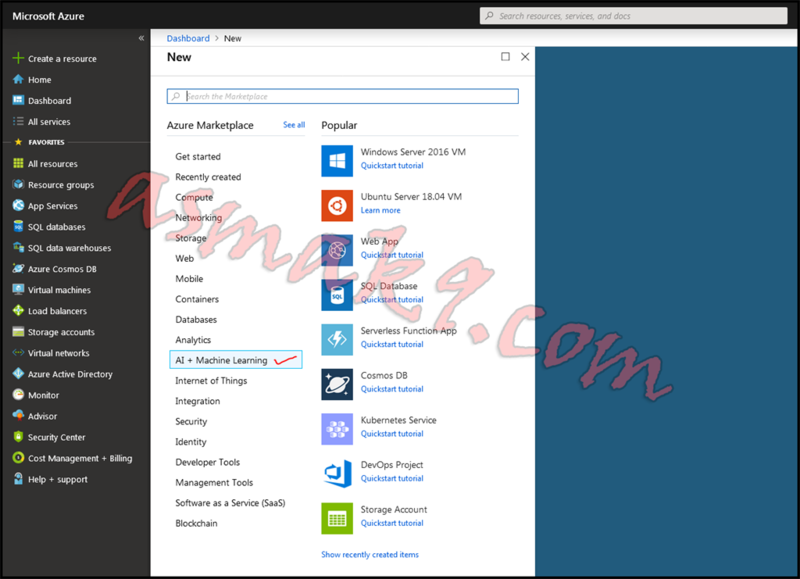 Then, click "AI + Machine Learning" category from the Azure Marketplace. Click "Data Science Virtual Machine Windows 2016" as shown below. 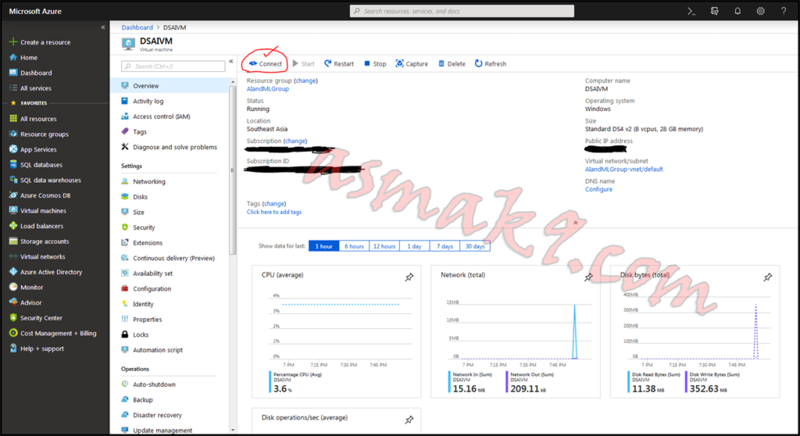 Now, fill the form with your details - your Azure subscription, target resource group, the name of the virtual machine, your physical storage server location based on Azure Latency Test as this will affect your cloud service performance. The smaller the latency time, the better the performance. So, choose accordingly and set your virtual machine administrative credentials. 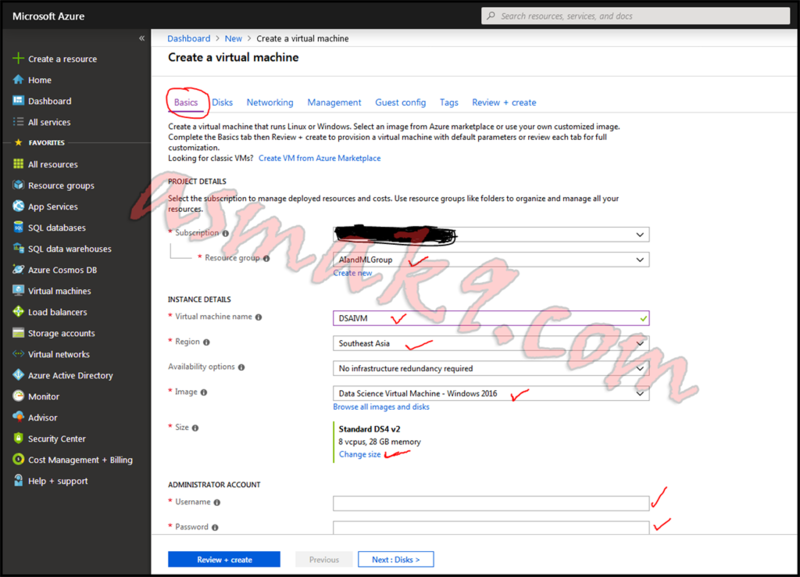 In the above step, you also need to choose your target virtual machine. The default selection is Data Science Windows 2016 VM and you can also change your RAM size and processors according to your need. The extended amount is chargeable, so choose what fits your costing requirement. My selection is shown below. Click the "Review + Create" button. On the "Review + Create" tab, you will notice a special cost that is not covered by your Azure subscription. Don't worry, it is free. 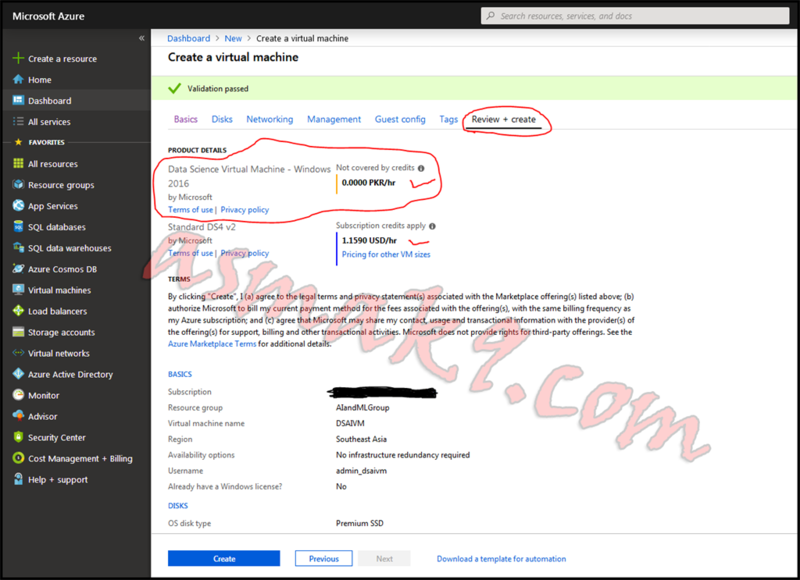 The reason behind mentioning it here is basically to remind you that any new tool you install on this virtual machine which has any sort of purchase cost whether licensing or other costs, your Azure subscription is not responsible to cover that. You have to additionally pay that cost on your own. So, Microsoft Azure subscription does not charge any such cost during installation. Since the Data Science virtual machine Windows 2016 is pre-installed with shareware license, the additional cost on them is your own responsibility. Now, click "Create", as shown below. Wait a few moments while your Azure Data Science Windows 2016 VM is being deployed. Pin your studio to the dashboard if you want. Now, click your Data Science Windows 2016 virtual machine that you have just created and have pinned to the dashboard. 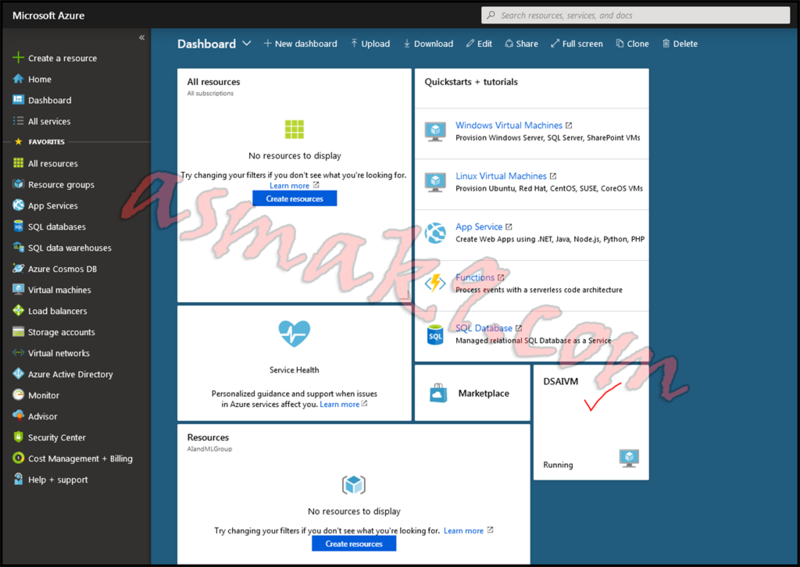 In the above screen, you have the connection information to access your Azure Data Science Windows 2016 virtual machine. 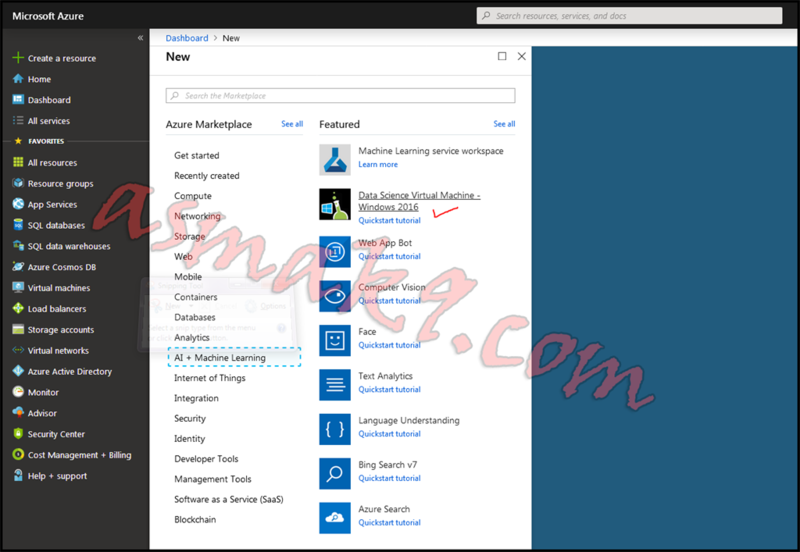 In this article, we learned how to set up Azure Data Science Windows 2016 virtual machine and how to deploy it on your paid subscription by selecting suitable RAM size and processors.